Storytelling in museum environments can be â€˜materializedâ€™ using print and visual media formats. The use of graphical visualization techniques improves the interpretation in a narrative context, hence helps to convey information and deliver a better understanding of a story. This research was prompted by the rising use of interactive visualization techniques for â€˜storytellingâ€™ in museum environments. A. Burdick, J. Drucker, P. Lunenfeld, T. Presner, and J. Schnapp, Digital Humanities. Cambridge, USA: Massachusetts Institute of Technology (MIT), MIT Press, 2012. J. Drucker, D. Kim, I. Salehian, and Bushong, â€œIntroduction to Digital Humanities.â€ 2014. 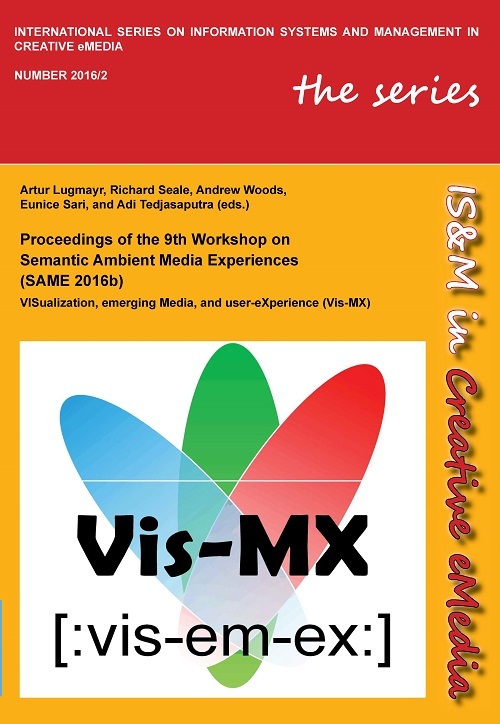 A. Lugmayr and M. TerÃ¤s, â€œImmersive interactive technologies in Digital Humanities: A review and basic concepts,â€ in Proceedings of the 3rd International Workshop on Immersive Media Experiences, Brisbane, Australia, 2015, pp. 31â€“36. A. Lugmayr, A. Greenfeld, A. Woods, and P. Joseph, â€œCultural visualisation of a cultural photographic collection in 3D environments - Development of â€˜PAV 3Dâ€™ (Photographic Archive Visualisation) In: Wallner G, Kriglstein S, Hlavacs H, Malaka R, Lugmayr A, Yang H-S, editors. Entertainment Computing,â€ presented at the ICEC 2016: 15th IFIP TC 14 International Conference, September 28-30, 2016, Vienna, Austria, 2016, pp. 272â€“277. C. Chen, Information visualization: beyond the horizon, Second. London: Springer London, 2006. A. R. Gaviria, â€œWhen is visualization art? Determining the critical criteria,â€ Leonardo, vol. 41, no. 5, pp. 479â€“482, 2008. F.-S. Hsu and W.-Y. Lin, â€œA multimedia presentation system using a 3D gesture interface in museums,â€ Multimed. Tools Appl., vol. 69, no. 1, pp. 53â€“77, 2014. P. Joseph, â€œHeritage of the Markham car collection: Estrangement from the West Australian Motoring Community,â€ Collect. J. Mus. Arch. Prof., vol. 12, no. 1, pp. 21â€“44, 2016. E. Segel and J. Heer, â€œNarrative visualization: telling stories with data,â€ IEEE Trans. Vis. Comput. Graph., vol. 16, no. 6, pp. 1139â€“1149, 2010. K.-L. Ma, I. Liao, J. Frazier, H. Hauser, and H.-N. Kostis, â€œScientific storytelling using visualization,â€ IEEE Comput. Graph. Appl., vol. 32, no. 1, pp. 12â€“19, 2012. J. Stikeleather, â€œHow to tell a story with data,â€ Harv. Bus. Rev., 2013. C. Chen, â€œInformation visualiation,â€ Issue Wiley Interdiscip. Rev. Comput. Stat. Wiley Interdiscip. Rev. Comput. Stat., vol. 2, no. 4, pp. 387â€“403, 2010. J. Sviokla, â€œSwimming in data? Benefits of visualisation,â€ Knowledge Management, 2009. .
M. Dijkstra, H. Buijtels, and W. F. van Raaij, â€œSeparate and joint effects of medium type on consumer responses: a comparison of television, print, and the Internet,â€ J. Bus. Res., vol. 58, no. 3, pp. 377â€“386, 2005. T. T. BrunyÃ©, H. A. Taylor, D. N. Rapp, and Spiro Alexander B, â€œLearning procedures: the role of working memory in multimedia learning experiences,â€ Appl. Cogn. Psychol., vol. 2Ã¶, no. 7, pp. 917â€“940, 2006. A. Gaur and K. K. Grover, â€œApplication of multimedia in the industrial sector,â€ Comput. Control Eng. J., vol. 12, no. 4, pp. 197â€“200, 2001. DAWSON, Beata; JOSEPH, Pauline. Cultural Heritage Visualization: Using Interactive Multimedia in Museum Environments. International SERIES on Information Systems and Management in Creative eMedia (CreMedia), [S.l. ], n. 2016/2, p. 1-10, june 2017. ISSN 2341-5576. Available at: <http://www.ambientmediaassociation.org/Journal/index.php/series/article/view/243>. Date accessed: 23 apr. 2019.